Chennai/Shirdi, 29 July: A group of thirteen Sai Baba devotees from Chennai walked all the way to Shirdi with “Sai Baba’s palanquin”. 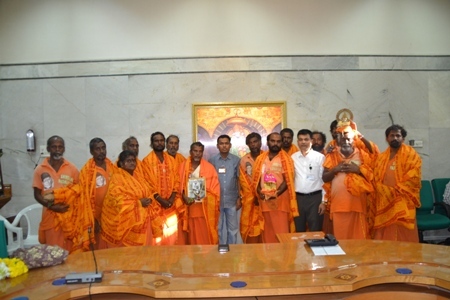 On their arrival in Shirdi on July 27, Deputy Executive officer of Shri Saibaba Sansthan Trust, Appasaheb Shinde warmly welcomed and congratulated them for their 31-day feat. This is not for the first time for this group to make the 1650 km long walkathon from Chennai to Shirdi. “We have been walking the distance for the past four years invoke Sai’s blessings”, V. Chandramouli, who has been leading the ‘long march’, said. He added that every year they carry Sai Baba’s palanquin as a mark of their devotion to the deity in Shirdi. “Next year, we wish to bring Sai Baba’s chariot”, the Sai Walkers’ leader said. Other members of the Sai devotee group from Chennai making the long march are B. M. Gupta, Shridhar Gupta, T. D. Ashokkumar, S. Kartikeyan, S.S. Anand, A. Radhakrishnamurti, A. Suman, P. S. Parmeshwaran, M.S. Shaktidayalan, S. Mohanraj, P.V. Kadiravan, M. Lingam, R. Udaykumar, and R. Umadan. The group used to walk fifty kilometres every day. They covered the 1650 km distance between Chennai and Shirdi in 31-days. After leaving Chennai, they took “Sai Darshan” at Sai temple in Mailapur, and paid their obeisance at Pattipulam Sai temple. Pattipulam is some 70 Km from their starting point. Here the Temple President K. V. Ramani felicitated every one of the Sai walkers with Tulsi garland, and wished them ‘a happy, comfortable, walk ahead’. Ramani kept in touch the ‘walkers’ throughout their march inquiring about their health. Chandramouli and his team of devotees visited Tirupati and Pandharpur enroute. At Tirupati, they invoked the blessings of Balaji. And at Pandharpur, the Sai Walkers had Darshan of Shri Vithhal. Welcoming them, Appasaheb Shinde wished them a great Darshan and comfortable stay in the temple town. He assured them of all necessary help, according to Sansthan PRO, Mohan Yadav.